A few inches of fresh dry snow yesterday will not be changing the overall avalanche danger. Above treeline remains MODERATE, for smaller reactive slabs in wind loaded areas. The backcountry is slowly moving towards stable, in fact the more important safety issue is probably related to exposed rocks and trees with thin snow cover. Below treeline is LOW danger with very shallow snow coverage. When you take your skis off and try to walk around in your boots, the lack of strength in the snowpack is instantly apparent. My boots sank through all the layers, only stopping at the ground a little more than 2 feet down. The slab/weak layer combination is still the same as it was last Friday, but not nearly as unstable as it was then. The same equation is there, with stronger and denser storm snow from Nov. 21st on top of very weak and loose faceted snow. The reason why we don't have a big problem at the moment is that the relatively denser slab layer is actually quite soft and not very strong or cohesive compared to the weak layer underneath. This snowpack still has the potential to become dangerous if we got a wet/heavy storm, but until then the avalanche danger will be isolated. 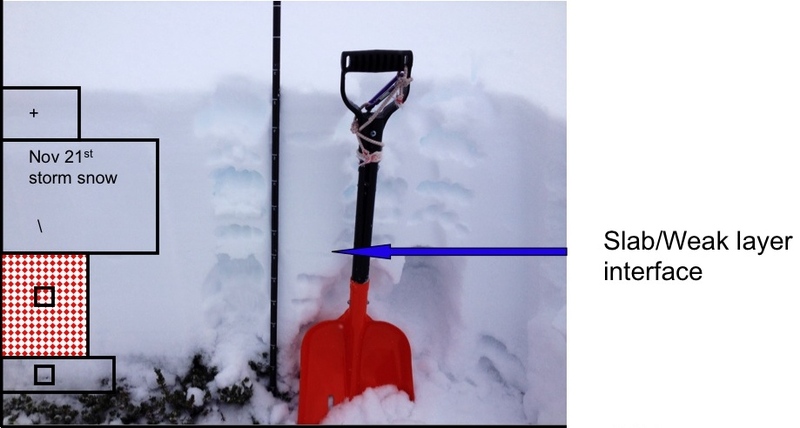 Our snowpit tests indicated relatively good stability. An extended column test revealed no tendency to propagate. If someone were to venture into steeper wind loaded terrain, I wouldn't be surprised to hear of reactive wind loaded pockets. The main deterrent from going those places will be thin snowcover and exposed rocks rather than the avalanche conditions. Click here for a more detailed writeup on the pit profile below. Turnagain Pass received roughly the same amount of snow yesterday as Anchorage did. That 3-5 inches of light, dry snow certainly improved the surface conditions, but still leaves a lot to be desired in terms of adequate snow depth. It looks like our precipitation is shut off for the next few days. We can expect colder temperatures by this evening, remaining in the single digits or teens for the rest of the holiday weekend. Expect a moderate NW wind in the mountains today, 25-45mph. Clouds today will give way to clear skies by this evening.